On Tuesday, March 13, 2018, join us in supporting Trinity Christian College for #TrinityTuesday. 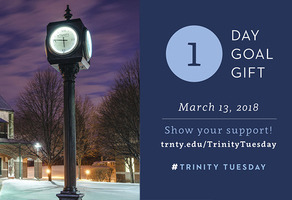 On Tuesday, March 12, 2019, join us in supporting Trinity Christian College for #TrinityTuesday. One Day. One Goal. One Gift. Join Troll fans from across the nation to support our athletes. Go TrollNation! Show your support of nursing at Trinity by helping us endow a $1,000 scholarship that will be awarded to one new nursing student every year! 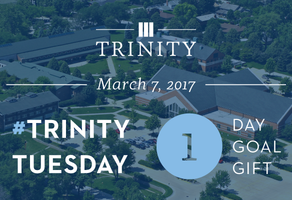 On Tuesday, March 7, 2017, join us in supporting Trinity Christian College for #TrinityTuesday. Make an impact at Trinity Christian College! Connect with other Trolls on GiveCampus!